The sadistic and psychopathic Colonel Hogan (David Campbell, The Deadliest Prey, Relentless Justice) is a mercenary for hire who finds a benefactor in Don Michaelson (Troy Donahue, Shock 'Em Dead, Cry-Baby), a ruthless businessman in need of skilled killers for a special assignment. It's a win-win for both sides. Michaelson will finance Hogan's training camp and Hogan will use his trained mercenaries to help out Michaelson. Hogan has the manpower. What he doesn't have is the prey to hunt in preparation for the big day. His solution: troll the streets of Los Angeles and randomly abduct people. What Hogan didn't count on was that one of those people would be Mike Danton (Ted Prior, The Deadliest Prey, Relentless Justice). Danton, a Marine with killer skills, doesn't take too kindly to being kidnapped. 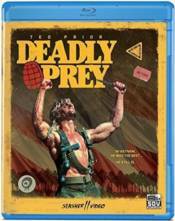 Hogan, Michaelson and the mercenaries are in for a world of pain in the action-packed thrill ride Deadly Prey. Deadly Prey co-stars Cameron Mitchell (Hombre, Klansman), Dawn Abraham (Mike's Murder) and Suzzane Tara (TV's General Hospital).